Pretend for a moment that you’re in the market for a new TV, and you just walked into Best Buy. In which of these 2 scenarios would you be more likely to make a purchase? You: Yeah, I’m looking for a TV. Employee: Aisle 6, all the way back and to the right. Employee: Sure, come with me. We have lots to choose from. What size are you looking for? Any specific features you’d like? What is your budget for this purchase? The answer here should be pretty obvious, right? The customer service—and the likelihood of making a sale—are much better in scenario B. In scenario A, the employee gives you a vague idea of where to go…but they leave you to find the way on your own. So first you have to make your way to the TV section, and then you have to browse through all the different models and make a purchase decision—all on your own. But in scenario B, the employee leads you exactly where you need to go. They talk with you to learn more about what you’re looking for, and ask several pre-qualification questions to narrow down the best options for you. So why do I bring up this example now, and how does it relate to this ManyChat case study? Because most websites work like the employee in scenario A. Sure, your website might give people signposts to help them find what they’re looking for—signposts like your menu system. (Just like Best Buy has a big sign that says “TVs” hanging from the ceiling.) Ultimately, however, your visitors are left to find their way on their own. 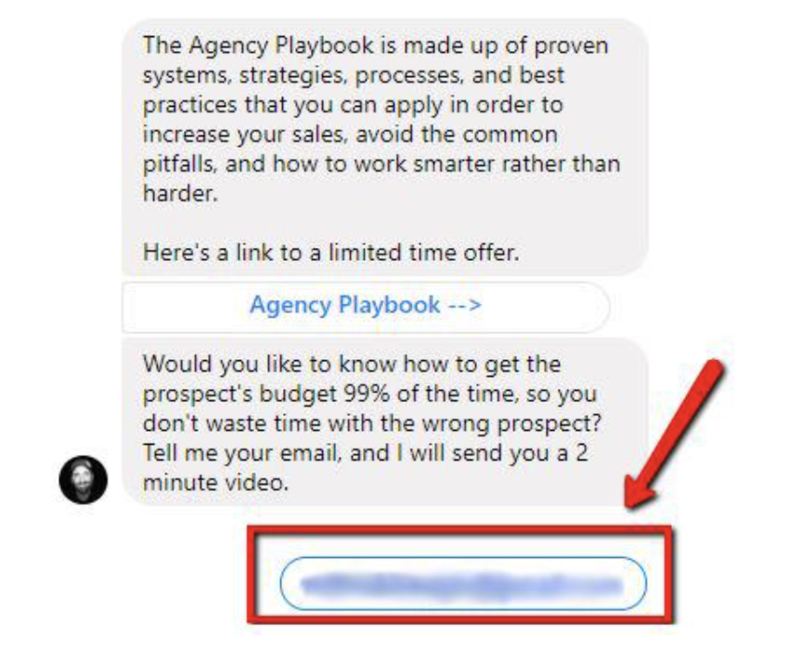 But thanks to Facebook Messenger Marketing, it’s getting easier for businesses to give people that “scenario B” experience—even when they’re just browsing your website. The first step in any Messenger Marketing funnel is the same: you have to actually get people into a conversation with your chatbot. There are a lot of ways to do this like Facebook Messenger Ads, comment-to-message posts in Facebook, and so on. I used my chatbot to replace the “Contact” page on my website. And I think this makes a lot of sense! 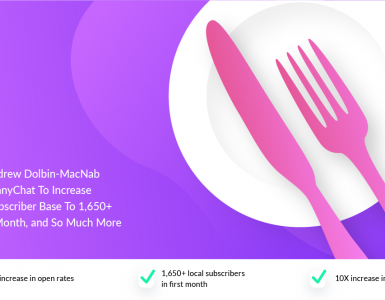 Using ManyChat creates a more gratifying user experience because users receive immediate interaction rather than waiting for a response after filling out a contact form. It’s the instant gratification our society has come to expect. …you will NOT see a typical “Contact Us” page. Instead, that link will open Messenger in a new tab, where it will automatically begin a conversation with my chatbot. It still serves the function of the “Contact” page—people can contact me, after all—but instead of a generic web form, you have a much cooler, newer, and more personal method of communication. 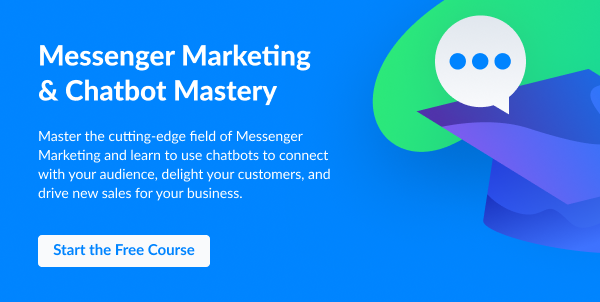 Now because this Messenger Marketing funnel strategy was working so well, I also added 2 different Growth Tools to my website to help initiate even more Messenger conversations. As you can see, I set this Growth Tool up on the sales pages for some of my products. 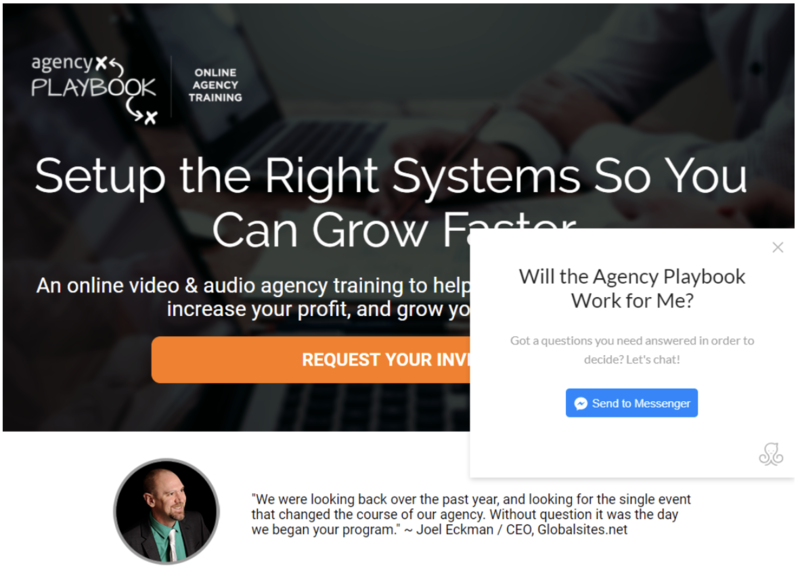 On this particular page the growth tools says, “Will the Agency Playbook Work for Me?” So if someone is reading this page and is unsure about how this product would work for them, this gives them an easy way to ask me their questions. A conversation with my chatbot. When you begin a chat with my bot, the first thing you see is a GIF of Don Draper looking cool and stylish as only Don can. Ladies and gentlemen, this…is the DonBot. As soon as you start the conversation, Don proceeds to ask you (in his suave way) all the same questions that I would ask people, personally, if I were there in person. Essentially I’m filtering down to fit you into one of the main customer “buckets” that I serve. But keep in mind it’s important to limit your follow-up to 2 or 3 questions. More than that and people start to get turned off by the automation. Then, based on your responses, I recommend the product or service of mine that is most relevant to your situation. And I always follow up in person. The purpose of the bot is not to make the sale; the bot is there to keep the customer engaged longer. These bot-led Facebook Messenger conversations take a different shape and form depending on how you set up the sequence. I would discourage you from automating everything, though. It’s important to have a live person monitor and engage after the preliminary messaging sequence. So for example, if you own an agency with a revenue of $1 million, I might recommend personal consulting with me—so I can really dig in and help find the sticking point in your agency’s growth. But if you’re just starting an agency, I’ll recommend my Agency Playbook instead as a more cost-effective way to help get your new agency off the ground. …then recommend the product or service that’s most relevant for them. We aren’t reinventing the wheel here. Just helping people find what they’re looking for. 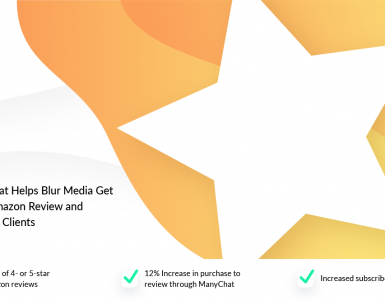 ManyChat makes it easy to follow up with prospects, so why not take advantage of that? 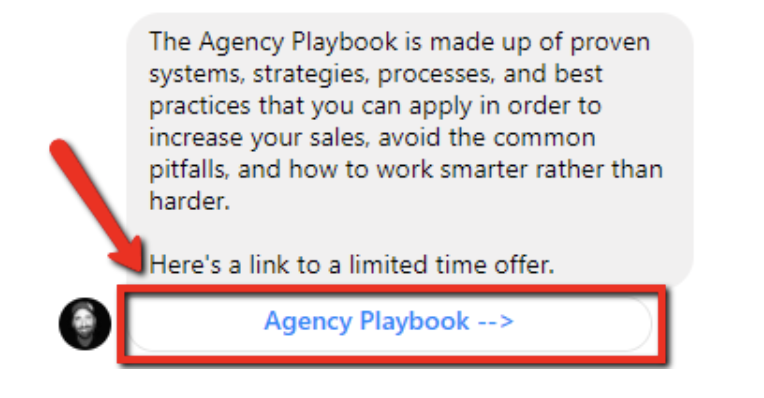 First, I tag everyone in Messenger who clicks on one of my product links (like “Agency Playbook”). This way I can send a follow-up message a few days later. And from now on I can contact you via both email and Messenger. It makes it really easy for people to share their email address. It’s likely to be a GOOD email address (and not biteme@yousuck.com). At this point I could stop. And the chatbot would be successful. But I don’t. I take it one step further. Because in my case, I’m selling some high-ticket items that make it worthwhile to personally reach out and answer questions from qualified prospects. And I do this a little differently than most people. Instead of typing out a response in Messenger, I use my iPhone/iPad to record a short audio message and I’ll send that instead. So instead of seeing my response typed out on the screen, they’ll hear a short recording of my voice. People don’t get this kind of message very often, so it stands out to them. It’s also easier for me to talk than it is to use the cramped little keyboard on a smartphone. And the awesome thing about chatting with prospects on Messenger is that no matter when I respond—if it’s 30 minutes later, 3 hours later, or 3 days later—they’re going to see that response right away. Their phone’s going to vibrate in their pocket and there’s a good chance they’re going to at least open and read that message. 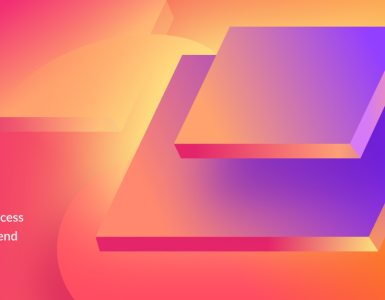 After about two months, program sales had doubled and high-end services increased 74%. Overall increase in revenue: about $250,000. So it’s safe to say the results were a huge success. As you can see, I haven’t done anything earth-shattering here. I created a simple chatbot that you access from my website. So why is this chatbot so effective? I don’t try to fool people into thinking that the bot is a real person. I come right out and tell them it’s a bot. I think that transparency is important. And it’s not just some nameless, faceless bot. It’s the DonBot. It has a personality. It’s fun and unique, which helps engage people. I’m not trying to force anything on people here. The point isn’t to convince people to sign up for something they don’t want or need. Instead, I’m just answering questions and trying to help people get what they’re looking for. The first thing my chatbot does in every conversation is ask a few quick, easy questions that tell me exactly who I’m talking to. This means anytime I’m answering a question for somebody in Messenger I know exactly who I’m talking to, and I avoid wasting time or resources on someone who isn’t the right fit for my business. It tags users for easy follow-up. When a user responds to my automated questions, it does more than just pre-qualify them. 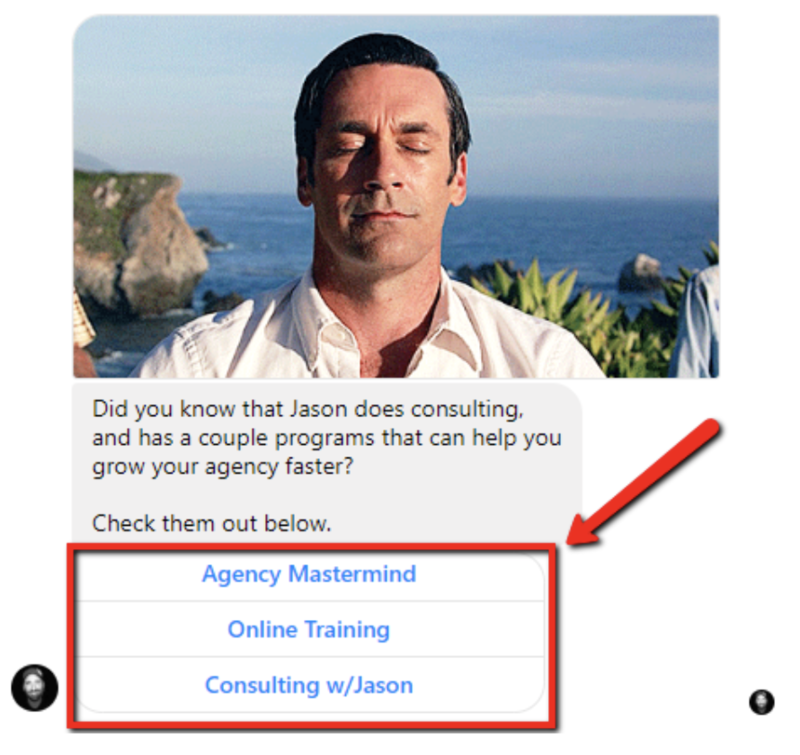 It also tags the user with relevant information, allowing me to easily follow-up with qualified leads in the future. A lot of people have talked about the awesome deliverability of Messenger Marketing, so I won’t rehash it here. Just suffice it to say that way more people open Messenger chats than open emails. And because most people are plugged into Facebook 24/7 on their desktop or mobile phones, most users respond immediately. 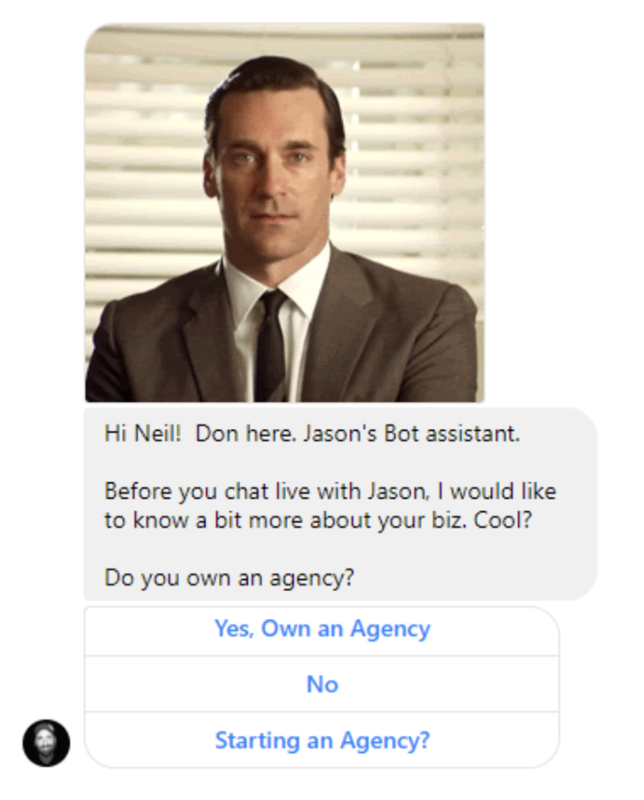 Unlike email conversations, which can drag on for days or even weeks, Facebook Messenger marketing allows me provide immediate responses to inquiries. 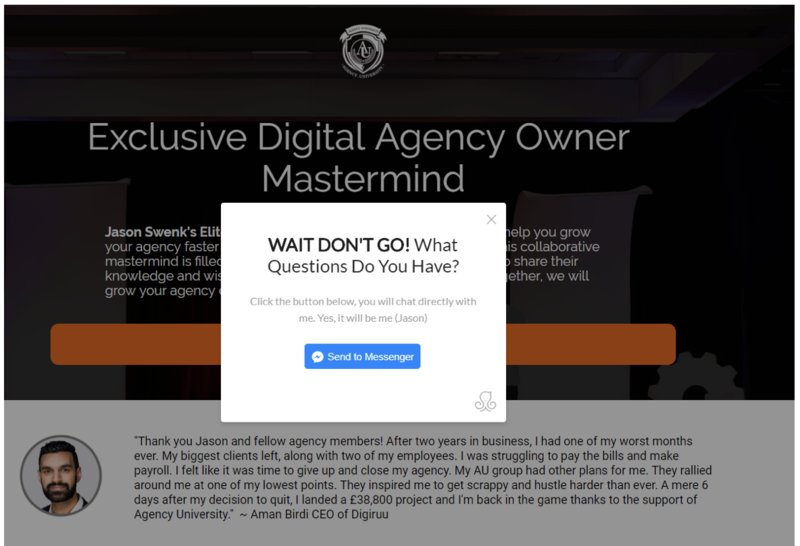 This gives the user a positive experience right away, and allows me to take advantage of their interest before my leads have time to leave or forget about me. That translates to fewer lost opportunities for my business. There are two things I hope you take away from this case study. First: I know it’s easy to fall in love with the set-it-and-forget-it automation tools available with most marketing platforms today. But don’t underestimate the power of real, human interaction! The fact that I answer questions personally—and using voice messages, which makes them seem even more personal—goes a long way in building trust and credibility with my visitors. It scores me bonus points for sincerity and authenticity. 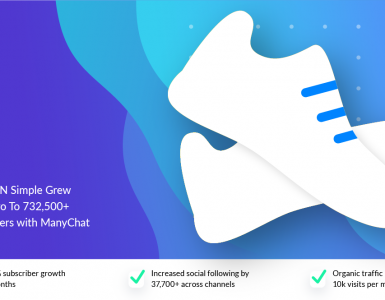 And it’s a big part of the reason why this chatbot increased sales of high-value services by 74%. Second: Notice how simple this chatbot is. No complicated flows or intricate Facebook ad campaigns required. Just a “Contact” page linking to a simple chatbot. You can do some amazing things with ManyChat and chatbots. Construct elaborate customer journeys with branching logic, conditional statements, and all of that cool stuff. But this case study goes to show your chatbot doesn’t need to be complicated to be effective. As long as you create something that really, genuinely helps people, you’re going to be happy with the results. 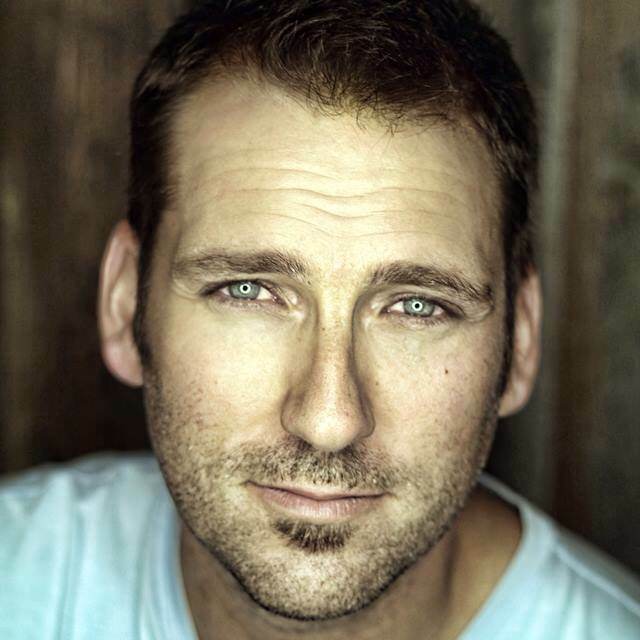 Jason Swenk is an international speaker who provides valuable material to educate and entertain audiences. Jason is a big kid, former digital agency owner, entrepreneur, podcaster, YouTuber, Ironman, Crossfitter, ex-actor in a B-rated movie, and much more. 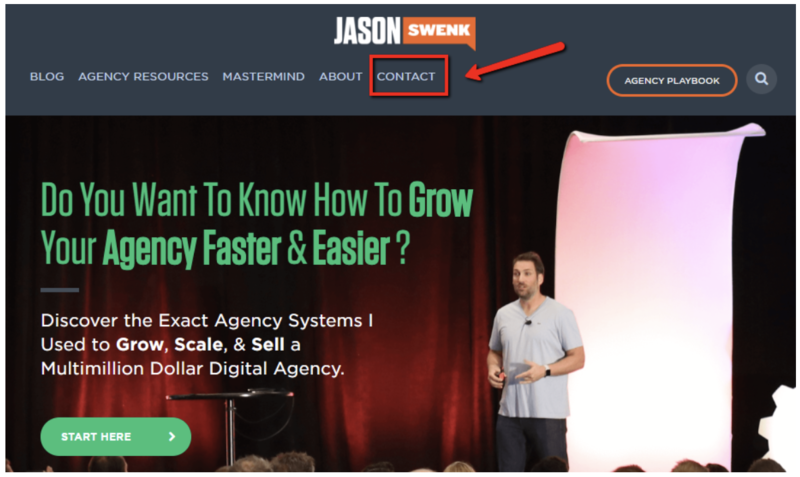 He has a passion for digital marketing and is the founder of JasonSwenk.com, a resource for digital agency owners who want to start, scale and sell their business. He also host two weekly shows, and sometimes he host the neighborhood block party. Great article! In step three, it says, “send a follow-up message a few days later…” does the 24-1 rule not apply?